Shattering silk and bright lights: where have all the coloured warps of the doll’s apron gone? By Laura G. García Vedrenne, second year student, MPhil Textile Conservation. A.1939.45.l / CTC.422 Bisque doll with apron, after conservation. 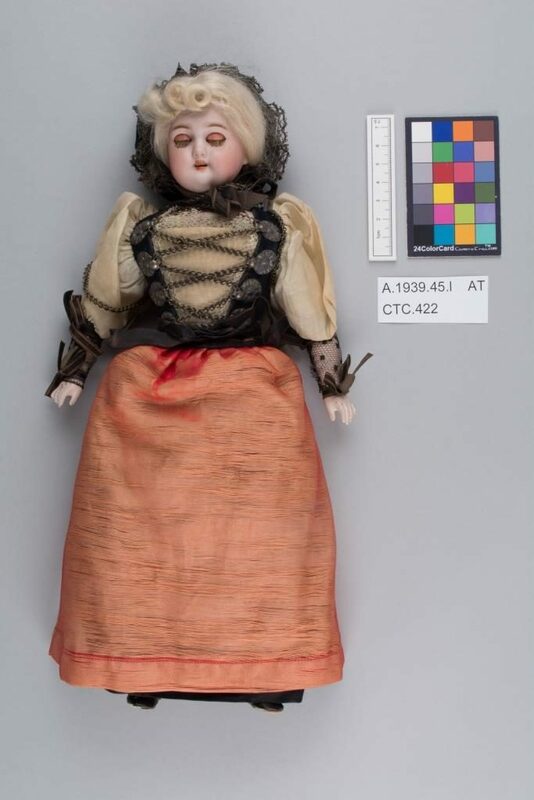 Muñeca con delantal, después de procesos © CSG CIC Glasgow Museums Collection and University of Glasgow, 2018. As part of our taught lessons at the CTC, we study photodegradation and its effects on dyes and textile fibres. Last semester, I treated the apron of an early 20th century bisque doll dressed in regional costume, belonging to Glasgow Museums, which had suffered the severe effects of exposure to ultraviolet radiation. A.1939.45.l / CTC.422 Apron (front), before conservation. Delantal (frente), antes de procesos © CSG CIC Glasgow Museums Collection and University of Glasgow, 2018. A.1939.45.l / CTC.422 Apron (back), before conservation. 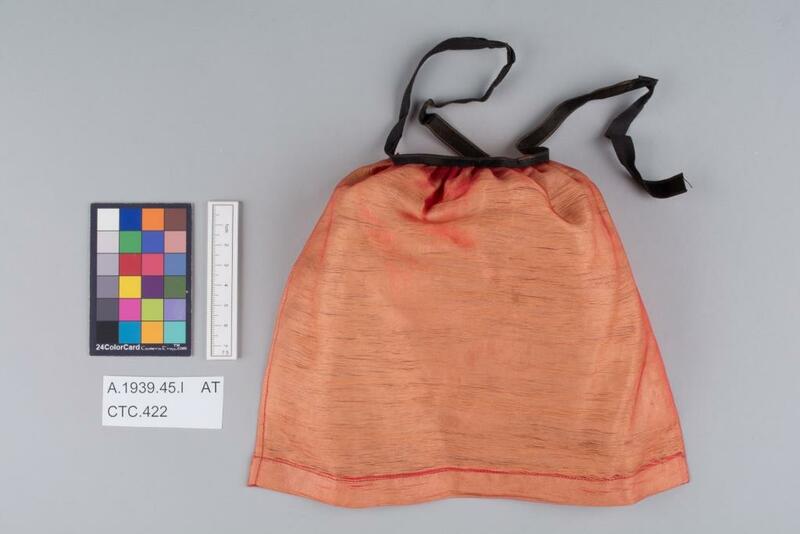 Apron (reverso), antes de procesos © CSG CIC Glasgow Museums Collection and University of Glasgow, 2018. Based on the differences in clothing styles, used materials, and selection of colours, the doll’s dress resembles the traditional festive attire used in Bern, Switzerland. The apron’s textile is a satin weave (4/1) in which the undyed cotton wefts would remain hidden by the fine pink/reddish silk warps. The selvedge is located on the proper left side of the doll. Hems on the right-side and lower and bottom part were machine-stitched. Fading and loss of warp threads. Decoloración y pérdida de hilos de urdimbre © CSG CIC Glasgow Museums Collection and University of Glasgow, 2018. Before conservation treatment, the fabric was extremely fragile due to the loss of warp threads from photodegradation and mechanical stress. Silk warp threads were subject to tension breaks, resulting in lifted, fluffy surfaces and frayed appearance at the fibre ends. Since floats are not bound as often in satin-weave textiles, a significant part of the structure was lost when the surface abraded or when threads disintegrated. This damage covered approximately 80% of the apron. There was also evidence of severe fading and brittleness of the silk fibres, where the dye’s mechanism of degradation caused by light catalysed chemical changes in the fibre substrate as well. Evidently, the weave was lost and the weft threads were only held in place by the stronger support of the selvedge and the hems. The folded and creased areas of fabric were better protected from light exposure, so the silk floats remained vibrant red in these areas. In addition to the visual impact of fading, light exposure also decreased tensile strength. This type of degradation is frequently seen in silk fibres, where hydrolysis, photolysis, and oxidation mechanisms have been triggered. Therefore, the apron required additional support to stabilise the damaged weave. A combined adhesive technique with supplementary stitching was considered beneficial to enhance the apron’s long-term preservation by imparting structural stability without restraining movement, conserving the textile’s flexibility and free-hanging quality. Realignment of weft threads. Realineación de hilos de trama © CSG CIC Glasgow Museums Collection and University of Glasgow, 2018. Conservators know that damage caused by light is irreversible and cumulative. Therefore, once a textile loses its colour, there is little we can do to solve issues related to aesthetic problems. 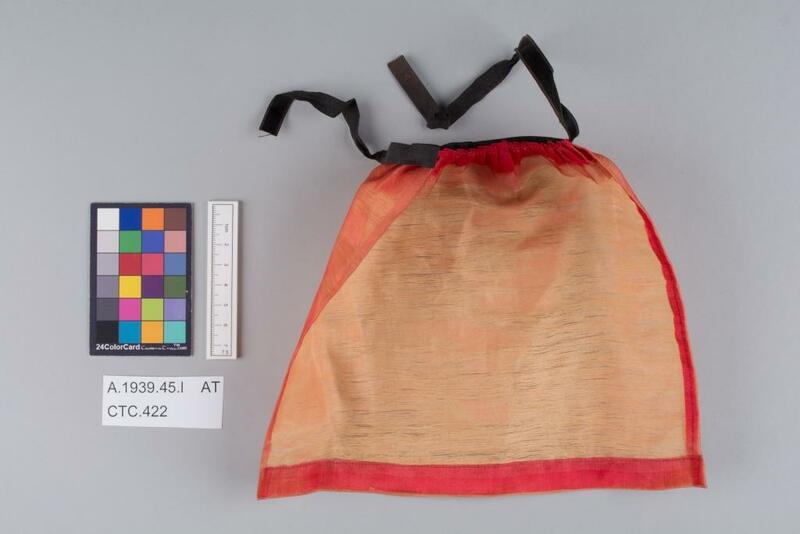 After discussion with Glasgow Museums’ textile conservator about the desired visual effect of the apron’s colour, two different dyeing tonalities were selected for the supports: a slightly faded pink-beige colour was chosen for the back support, and an intense red was selected for the overlay. 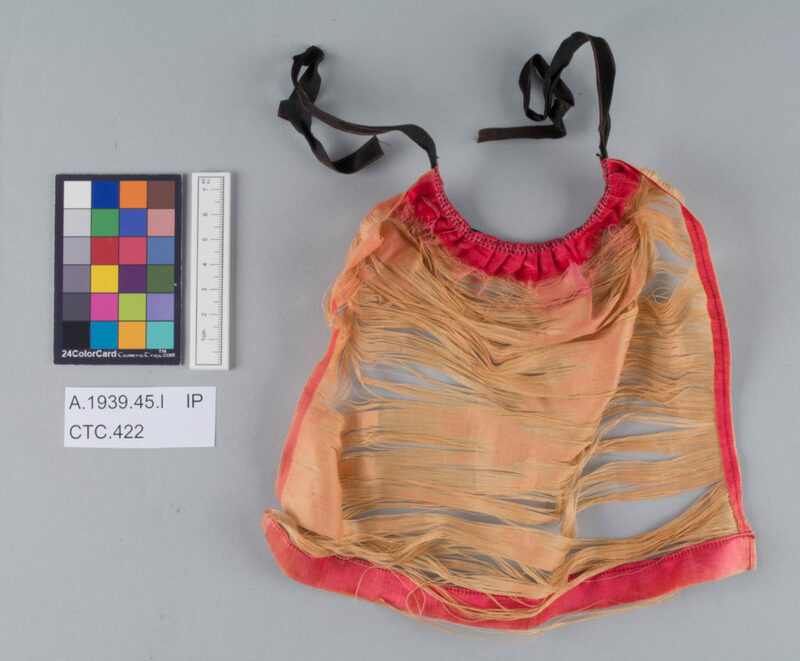 The dyed overlay worked for two purposes: as a protective layer for the brittle silk fibres and as means for the interpretation of the doll’s regional costume. A.1939.45.l / CTC.422 Apron (front), after conservation. Delantal (frente), después de procesos © CSG CIC Glasgow Museums Collection and University of Glasgow, 2018. A.1939.45.l / CTC.422 Apron (back), after conservation. Delantal (reverso), después de procesos © CSG CIC Glasgow Museums Collection and University of Glasgow, 2018. Nowadays, conservation practitioners invest efforts in developing preventive conservation measures to prevent fading from happening. Illumination for objects on display is controlled to block ultraviolet (UV) radiation and to avoid photodegradation. 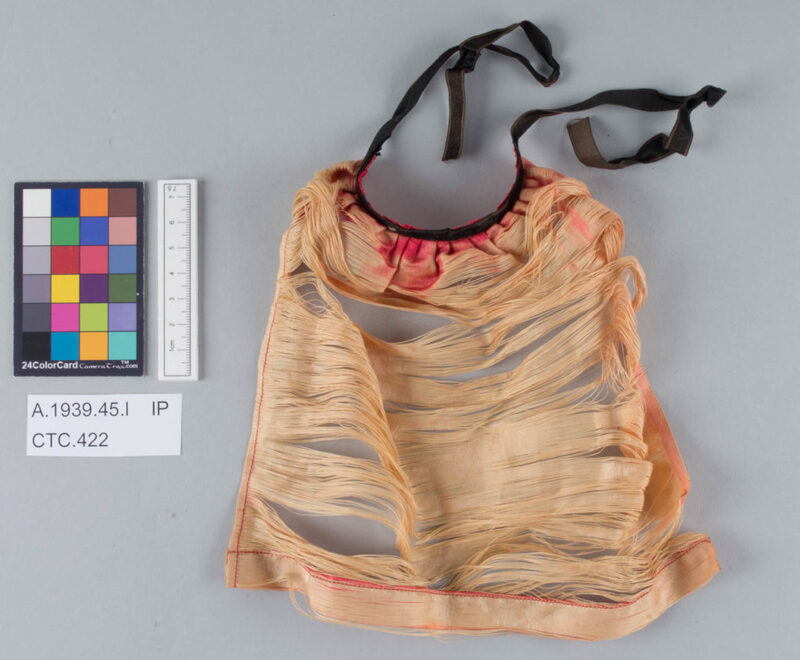 This approach is fairly recent (in fact, there is still on-going research to find out more about the fading risk for light-sensitive dyes and it was only a few decades ago that preventive conservation became a priority in museums. 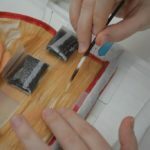 During the doll’s conservation treatment, a spectrophotometer was used to register measurements in different areas of the apron and to evaluate colour change related to fading. Photography was also kept minimal to avoid further exposure to light. Initial examination proposed using UV photography to support condition assessment but, after further reflection, it was decided that it was not worth exposing the faded object to such large amount of UV radiation to support the already-conclusive visual examination. In this sense, it was concluded that the second year workroom is free from UV radiation since it counts with counts with UV filters for bulbs and windows. It was also noted that diverse materials block visible light to different extents. Opaque and dark materials tend to offer better protection against visible light, although a simple Tyvek ® sheet is a good and easily accessible option. This testing informed the type of materials selected for the proposed temporary (during treatment) and permanent storage systems. Working on the conservation treatment of this doll was a practical challenge that encouraged me to engage with sources related to adhesives, fading, and contextual information about the object. I hope that, in the future, conservators that work on this dolls collection or on similar objects will take interest on researching the topic further. 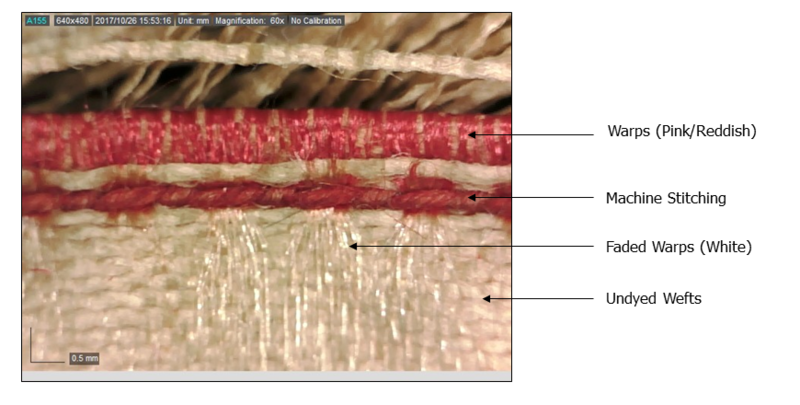 For example, it would be interesting to see if other fabrics from the dolls collection show similar degradation patterns of the silk components in relation to the lightfastness of sensitive dyes. Boersma, Foekje, Agnes W. Brokerhof, Saskia van den Berg, and Judith Tegelaers. “Light” in Unravelling Textiles, a Handbook for the Preservation of Textile Collections. London: Archetype, 2007, 47-60. Timár-Balázsy, Ágnes and Dinah Eastop, Chemical Principles of Textile Conservation. Oxford: Butterworth-Heinemann, 1998, 90-93. Condra, Jill. Encyclopedia of National Dress: Traditional Clothing Around the World. Santa Barbara: ABC Clio, 2013, 703. Mills, John, and Raymond White. “Fundamental Aspects of Deterioration” in The Organic Chemistry of Museum Objects. Oxford: Butterworth-Heinemann, 1999, 138.